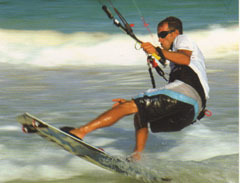 Activities on the aqua waters are numerous; jet skiing, water skiing, speed boat trips, hobie cat sailing, yachting, parasailing, banana boat rides, pedal boat rental, kayaking and fishing excursions in customized yachts are all available. The most fun and exciting ride you will ever take! Super fast Yamaha Wave Runners are waiting to take you on the ride of your life, right off the beach. Friendly staff will assist you before and after your ride to instruct you on the rules and safety areas to ensure that your ride is both fun and as safe as possible. Enjoy on-board platform parasailing with a specially designed boat, ensuring perfect take-off and landing every time. Let the wind and boat do all the work as you glide through the air getting a bird’s eye view of the city. Anyone can do it, just turn up to enjoy an unforgettable vacation experience! Hobie Cats (lightweight catamarans) are ideal for fun sport on the water. Suitable for all ages - you can sail it yourself or let the captain take you and your companion out for sailing adventure. Experience the real thrill of catching those big ones - your very own “catch of the day” - to grill and eat for supper. Longer trips can take you further offshore to the deeper waters - home to a wider variety and greater quantity of larger fish! All boats are skippered by experienced captain and crews using state- of-the-art GPS navigation, fish finders and safety to make your trip both fruitful and safe. Dubai offers great wave riding conditions all year round and professional wakeboard coaching facilities are available from the region’s top riders, using the best boats and equipment. From beginners to experts of all ages, the goal is to enhance wakeboarding as a lifestyle and not just as a hobby, providing top coaching with the best equipment available.